 When you use service by fb-geek.com it only need to enter the profile id of the account to be hacked and you can get the results within few minutes. In most of the times the movements are taken for hacking the account and the process is quite simple. There are differ people with different reasons for hacking the account. 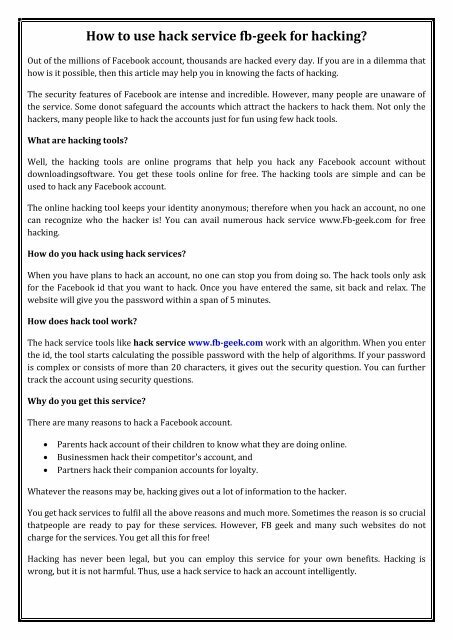 How to use hack service fb-geek for hacking? Out of the millions of Facebook account, thousands are hacked every day. If you are in a dilemma that how is it possible, then this article may help you in knowing the facts of hacking. The security features of Facebook are intense and incredible. However, many people are unaware of the service. Some donot safeguard the accounts which attract the hackers to hack them. Not only the hackers, many people like to hack the accounts just for fun using few hack tools. What are hacking tools? Well, the hacking tools are online programs that help you hack any Facebook account without downloadingsoftware. You get these tools online for free. The hacking tools are simple and can be used to hack any Facebook account. The online hacking tool keeps your identity anonymous; therefore when you hack an account, no one can recognize who the hacker is! You can avail numerous hack service www.Fb-geek.com for free hacking. How do you hack using hack services? When you have plans to hack an account, no one can stop you from doing so. The hack tools only ask for the Facebook id that you want to hack. Once you have entered the same, sit back and relax. The website will give you the password within a span of 5 minutes. How does hack tool work? The hack service tools like hack service www.fb-geek.com work with an algorithm. When you enter the id, the tool starts calculating the possible password with the help of algorithms. If your password is complex or consists of more than 20 characters, it gives out the security question. You can further track the account using security questions. Why do you get this service? There are many reasons to hack a Facebook account. Parents hack account of their children to know what they are doing online. Businessmen hack their competitor's account, and Partners hack their companion accounts for loyalty. Whatever the reasons may be, hacking gives out a lot of information to the hacker. You get hack services to fulfil all the above reasons and much more. Sometimes the reason is so crucial thatpeople are ready to pay for these services. However, FB geek and many such websites do not charge for the services. You get all this for free! Hacking has never been legal, but you can employ this service for your own benefits. Hacking is wrong, but it is not harmful. Thus, use a hack service to hack an account intelligently.